While doing clearpores review, I was so happy to have received an email from MyMomFriday that I won 2 FRO-YO Gift Certificates from TUTTI FRUTTI CENTRIS WALK! We have never been to Eton Centris Walk and the gift certificates are valid until August 31. So hopefully, we would have an opportunity to go there to see the place and claim the goodies too! And a few days after, I got another notification that I won some goodies from Unilab’s 1 day contest over their Facebook page! What a blessing! Even if I am drained financially, I really am so thankful for God’s favor over these small blessings! These are amazing treats for a busy mom like me! 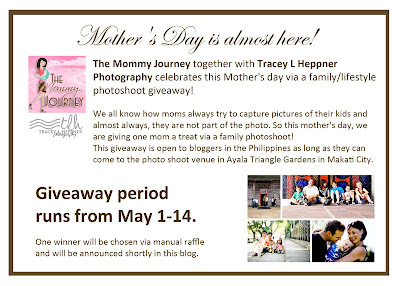 Thanks to the 7 wonderful moms who joined my cause and giveaway this mother’s day! Here is the result of the manual raffle! I will contact the winner in a bit! Thanks for supporting Gentle Hands! We Won The Barbie Giveaway! I won a ticket from Erica‘s giveaway to the Heart of the Matter Online Conference! I have wanted to attend this online homeschool conference last year but wasn’t able to because of cost constraints. Now, I am quite excited to learn more about homeschooling from veterans who have been homeschooling for a few years already. The conference will be on February 21-23. There were a total of 56 entries and the winner is Mai Songalia of Mai Three Boyz!